U.S. House Republican Leader John Boehner campaigns for local candidates at The Spread Eagle Tavern in Hanoverton, Ohio. Will John Boehner Be Good for Education? You can tell a lot about a man from his tears, and House Speakerto-be John Boehner has always been a weeper. He cried on the House floor while defending the Wall Street bailout and once choked up during a partisan speech accusing Democrats of abandoning the troops in Iraq. But he also used to bawl every year during the fundraisers he co-chaired with his friend Ted Kennedy for cash-strapped Catholic schools. "John's got the biggest heart in the House," says Republican conference boss Mike Pence, who lost a leadership election to Boehner in 2006. "My preacher used to say, 'When the eyes leak, the head won't swell.'" On election night, after a wave of anti-Democratic anger assured Boehner the House Speaker's gavel he has long craved, the 60-year-old former business owner from southwest Ohio managed to keep his composure for most of his unusually solemn victory speech. But when he got to the part about "economic freedom, individual liberty and personal responsibility," about family and hard work, the blubbering began. "I hold these values dear because I've lived them," Boehner whimpered. "I've spent my whole life chasing the American Dream." As the tears flowed, he recounted how he started out mopping floors in his dad's tavern, worked night shifts to pay for college and "poured my heart and soul" into a small plastics company. "And when I saw how out of touch Washington had become," he continued, "I put my name forward and ran for office." After two decades in Congress  and two stints in the Republican leadership  Boehner is an unlikely crusader against the ways and means of Washington. For months Democrats lampooned him as a golf-addicted, lobbyist-encircled, chain-smoking Beltway insider with a weird orange tan and a radical right-wing agenda, the physical and political embodiment of everything Americans mistrusted about Republicans during the past two election cycles. But the tears reflect a side of Boehner that defies the country-club caricatures: a self-made businessman with working-class roots who obviously cares about more than his golf game, an amiable consensus builder who learned his people skills growing up with 11 siblings and one bathroom. The new Speaker, his allies say, is a levelheaded grownup, a pragmatic conservative with a sensitive side, a power broker but not a power addict, an unabashed institutionalist who has pledged to respect the rights of the minority, reduce the Speaker's authority to micromanage legislation and bring real democracy to the House. He's never requested an earmark, and members of both parties agree that he keeps his word. "That's what's missing today  you can agree to disagree honorably and civilly," says National Federation of Independent Business president Dan Danner, a longtime friend of Boehner's from Ohio. "John's pretty good at that." That said, the caricatures didn't materialize from nowhere. Many of Boehner's closest personal and political friends really are lobbyists for banks, insurers and other corporations. Ever since he first joined the House leadership 15 years ago, he has been a leading Republican ambassador to K Street. He was a staunch supporter of just about everything President George W. Bush did and an equally staunch opponent of just about everything President Obama has done. His emotional rant against the Obama health care bill  "Hell, no, you can't!"  has become a YouTube classic. He's all about winning; the day before the election, Boehner campaigned with an Ohio Republican long shot who had admitted he used to dress up like a Nazi for World War II re-enactments. His political opponents have no doubts about how to characterize him. House Committee on Education and Labor chairman George Miller says it's bizarre to describe him as anything but "a very hard-nosed Republican partisan," even though Boehner worked closely with Kennedy and President Bush on the No Child Left Behind education reforms in 2001. "That was long, long ago, in a universe far, far away," Miller says. "A universe that doesn't exist anymore." He has clearer memories of Boehner bottling up issues like the minimum wage, mine safety and nutritious school lunches. "People are grasping for flecks of bipartisanship, but that's not what John's about." Now America will find out exactly what Boehner's about. As a lieutenant to former Speaker Newt Gingrich, Boehner watched the last Republican revolution unravel from within, and he has been asking current GOP wise men for advice on avoiding Gingrich's mistakes. The oddly understated tone of Boehner's election-night speech  he twice declared that "this is not a time for celebration"  was no accident; he is desperate to avoid the overreaching bombast and look-at-me hubris that he associates with the Gingrich era. His speech focused on his desire to listen to and do the bidding of the American people, not his big ideas or big plans. He tried to position himself as the adult in the room. At the same time, Boehner is keenly aware that the GOP's Tea Party wing is suspicious of him as a go-along-to-get-along Establishment type. He has tried to signal to the insurgents that he considers himself one of them, appearing at their rallies, echoing their rhetoric, tempering his platitudes about trying to work with the President with red meat about the "failed Obama-Pelosi agenda." "This is not a time for compromise," Boehner said Oct. 27 on Sean Hannity's radio show, "and I can tell you that we will not compromise on our principles." Boehner declined to speak with TIME for this story; before the election, he didn't want to say anything too extreme that could energize liberals or too milquetoast that would alienate conservatives. And he still doesn't want to get pinned down on specifics beyond his support for a familiar Republican agenda of massive tax cuts and mostly unspecified spending cuts that would somehow reduce the deficit without affecting seniors, the troops or any popular government programs. The last time he tried to get specific, Boehner conceded on TV that he'd vote for Obama's plan to extend the Bush tax cuts aimed at the middle class if that were his only option, then had to backpedal to reassure conservatives he preferred to extend all the Bush tax cuts right up the income ladder. Most of those conservatives wished he'd just kept his mouth shut. And mostly, that's what he's doing  for now. 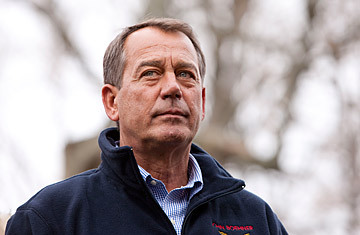 It's not as if John Andrew Boehner is a mysterious figure on Capitol Hill. He is what he is: a business-friendly conservative with a genuine aversion to taxes, regulations and earmarks; a pinstriped fundraising machine who once distributed campaign checks from a tobacco company on the House floor; a loyal Republican whose occasional drifts from the party line (on issues such as immigration and China) have tended to match those of the U.S. Chamber of Commerce. He's a patient leader who doesn't often pop off like Gingrich or bang heads like Tom DeLay; he's an even-keeled process guy who rhapsodizes about his love for the "people's House." None of that means he's a centrist or a moderate. "I have one of the most conservative voting records in the House," he told TIME at the start of this Congress. "But I don't wear it on my sleeve. I don't shove it in people's faces." Read "Obama Signals Compromise on Tax Cuts." See TIME's complete 2010 midterms coverage.